Elijah Jordan Wood is an American actor, which has grown up to be one of the most well-respected and steadily employed actors of his generation. Born in Cedar Rapids, IA, Wood modeled and did local commercials before moving with his family to Los Angeles in 1988. It was there that Wood got his first break, a small role in a Paula Abdul video. Film work almost instantly followed, with a bit part in the 1989 Back to the Future II. It was Wood's role as Aidan Quinn's son in Barry Levinson's 1990 Avalon (the third film in the Baltimore trilogy containing Diner  and Tin Men ) that first gave Wood attention, as the film received widespread critical acclaim and was nominated for four Academy Awards. After a small part in the Richard Gere potboiler Internal Affairs (1990), Wood secured his first starring role in Paradise (1991), in which he played a young boy who brings estranged couple Melanie Griffith and Don Johnson back together. He received good reviews for his performance -- some said it was one of the best things about the film -- and from there went on to co-star with Mel Gibson and Jamie Lee Curtis in Forever Young and in Radio Flyer (both 1992). In 1993, Wood co-starred with Macaulay Culkin in The Good Son, which was a failure both at the box office and with filmgoers who couldn't stomach the idea of the little blond boy from Home Alone as a pre-teen psychopath. In casting Wood as the good to Culkin's evil, the film helped further establish the kind of characters Wood was to become known for: thoughtful, well meaning, and perhaps a bit confused. Wood's next film, the same year's The Adventures of Huck Finn, provided a departure from this type of character, but The War (1994) with Kevin Costner marked something of a return. Also in 1994, Wood had the title role in North, a film remarkable for the volume of bad reviews and bad box office it received, but also for the fact that practically every bad review contained a positive assessment of Wood's performance. Wood's follow-up, the 1996 Flipper, was hardly an improvement, but the subsequent critical and financial success of Ang Lee's The Ice Storm (1997) provided a positive development in the young actor's career. As the soulfully dazed and confused Mikey Carver, Wood gave a portrayal remarkable for its rendering of the thoughtfulness and exquisite hopelessness inherent in the character. 1998's Deep Impact and The Faculty did not allow Wood the same degree of character development, but were great financial successes and further stepping stones in Wood's evolution from winsome child star to impressive young actor. Following a brief turn as the boyfriend of a wannabe hip-hop groupie in James Toback's problematic Black and White (1999), Wood further evolved as an actor in Lord of the Rings: The Fellowship of the Ring, the first installation of director Peter Jackson's adaptation of J.R.R. Tolkien's Lord of the Rings trilogy. His most hotly anticipated project, the 2001 film gave Wood top billing as Frodo Baggins alongside a glittering cast that included Ian McKellen, Cate Blanchett, and Liv Tyler. That same year the young actor could be seen in less mystical surroundings courtesy of Ed Burns' Ash Wednesday, a crime drama that also featured Oliver Platt and Rosario Dawson. In 2002, Wood let his vocal chords for Disney's straight-to-video release of The Adventures of Tom Thumb and Thumbelina. Of course, his most substantial role of 2002 is unarguably his return to the role of hobbit Frodo Baggins in the second installment of Tolkien's Lord of the Rings trilogy; specifically, Lord of the Rings: The Two Towers. 2003 proved to be a similar year for Wood -- after two relatively small jobs (his role credited only as "The Guy" in Spy Kids 3-D: Game Over and his stint as First Assistant Director in Sean Astin's The Long and Short of It served purely as a break for Elijah), the young actor once again resumed his role for The Lord of the Rings: The Return of the King. Though Return of the King is the last in the Tolkien trilogy, 2004 nonetheless looks to be a significant year for Wood, as he is slated to star in soccer flick Hooligans, as well work alongside Jim Carrey and Kate Winslet in director Michel Gondry's fantasy feature Eternal Sunshine of the Spotless Mind. In the latter, Wood significantly stretched his image by playing the Machiavellian Patrick, who slimily attempts to wheedle Kate Winslet away from Jim Carrey by trading on insider knowledge of the couple's sweet nothings. Riding high on the quadruple successes of the three Rings films and Eternal Sunshine, Wood projected wisdom and demonstrated great care in selecting his projects over the course of 2005 - his three features from that year scored with reviewers and at the box. Those included: Robert Rodriguez's critical darling Sin City, a testosterone-infused, live action adaptation of a comic book; Green Street Hooligans, where Wood tackles the challenging role of an expulsionary Harvard student thrust into the brutality of English football; and Liev Schrieber's bittersweet comedy-drama Everything is Illuminated, as Jonathan, a young man who travels to the Ukraine on a quest to find the woman who saved his grandmother's life. Over the course of 2006, Wood's fans can catch him in the period piece Bobby (on the assassination of RFK), the animated feature Happy Feet, and the military drama Day Zero, on the reinstatement of the USAF draft. Recent news reports, confirmed by Wood, have cited his plans to portray Iggy Pop in a biopic on the singer's life, slated to begin production in 2006. 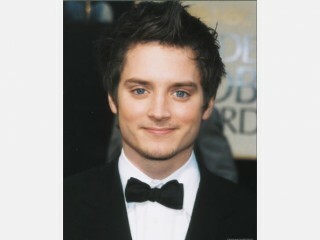 View the full website biography of Elijah Wood.